Last Monday, Jan. 28th, the John Paul II Catholic boys basketball team beat Leon 59-49. The two teams, separated by only four points with 1:26 left, struggled on offense but compensated with such physical defenses that spectators could have believed the teams were facing elimination. 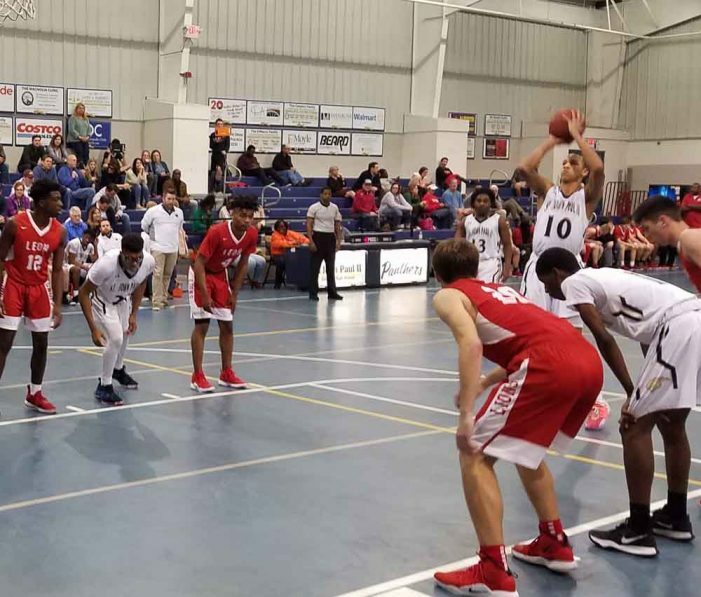 For the JPII Panthers, who enjoyed a 67-44 win against Leon in their first meeting, this down-to-the-wire game did much to convince an already successful team to push their play even further. After a slow first quarter, JPII trailed 11-13. The start differed from the offensive pace the Panther’s are familiar with, averaging over 60 points per game. Of JPII’s 26 games this season, the Panthers have only scored less than 60 points on seven occasions. But the lack of scoring had a root: a tough Leon Lion’s defense and referees who let physical plays continue. Because of this, the game got chippy. On separate occasions, referees issued warnings to JPII’s Allan Jeanne-Rose (#10) and Leon head coach Sean Crowe. JPII shooting guard Allan Jean-Rose said, “We played bad tonight. We had to fix some things and finish the game, even though we got off to a bad start.” Jean-Rose, a native of France, said the biggest adjustment to playing basketball in the U.S. has been more physical play and better fundamentals. Since their win against Leon, the Panthers have produced convincing wins against Florida High (65-43) and Florida A&M (87-51). Looking ahead JPII has a good chance of making a run in the 3A playoffs. Currently, the Panthers are undefeated in their district, which includes Pensacola Christian Academy, Florida A&M, Rocky Bayou Christian, and North Florida Christian; and MaxPreps.com ranks them third in the State of FL for the 3A Conference, behind Champagnat Catholic (Hialeah) and Orlando Christian Prep (Orlando).